In a prime-time speech from the Oval Office Sunday night, Obama said that the United States would defeat the threat of terrorism — without compromising American values. Obama began his third Oval Office address by remembering the 14 Americans who died in Wednesday&apos;s attack in San Bernardino, California. He noted that the FBI has no evidence that the attack was directed by a terrorist organization, but said it was clear the shooters had gone down the "dark path of radicalization." "This was an act of terrorism," Obama said, "designed to kill innocent people." He praised the work of counterterrorism officials who have "disrupted countless plots," and noted that terrorist attacks have shifted since Sept. 11 — changing from elaborate plots to less complicated attacks, like shootings at Fort Hood, Texas in 2009 and Chattanooga, Tenn., earlier this year, as well as the attack in San Bernardino. "The threat from terrorism is real, but we will overcome it," Obama said. "Our success won&apos;t depend on tough talk or abandoning our values or giving in to fear." He said victory against the Islamic State would involve hunting down "terrorist plotters" around the world, providing training and equipment to Iraqi and Syrian forces fighting the Islamic State, disrupting the organization&apos;s funding and recruitment and pursuing a cease-fire and political resolution in the Syrian war. But the president later added that it&apos;s important that the U.S. not get involved in an extended ground war in Iraq or Syria. At home, Obama said, he has ordered a review of the visa waiver program, and urged technology and law enforcement leaders to "make it harder for terrorists to use technology to escape from justice." He called for Congress to tighten restrictions on guns — prohibiting those on the no-fly list from purchasing weapons, and making it harder for anybody to purchase assault weapons — and put stronger screening in place for those who come to America without a visa. He also called for Congress to authorize the use of military force against ISIS, while noting that he has been ordering the military to strike Islamic State targets for over a year. The president exhorted the American people not to "turn against one another" — in particular, not to treat the fight against terrorism as a war between America and Islam. "ISIL does not speak for Islam," Obama said, using another acronym for the Islamic State. "They are thugs and killers, part of a cult of death." He also noted that most victims of terrorism are also Muslims. He called for Muslims to confront radical ideology. But he also said it was crucial for all Americans to reject discrimination, religious tests and "proposals that Muslim-Americans should somehow be treated differently, because when we travel down that road, we lose." The speech comes during a period of national anxiety, following a massive terrorist attack in Paris and the shooting in San Bernardino. 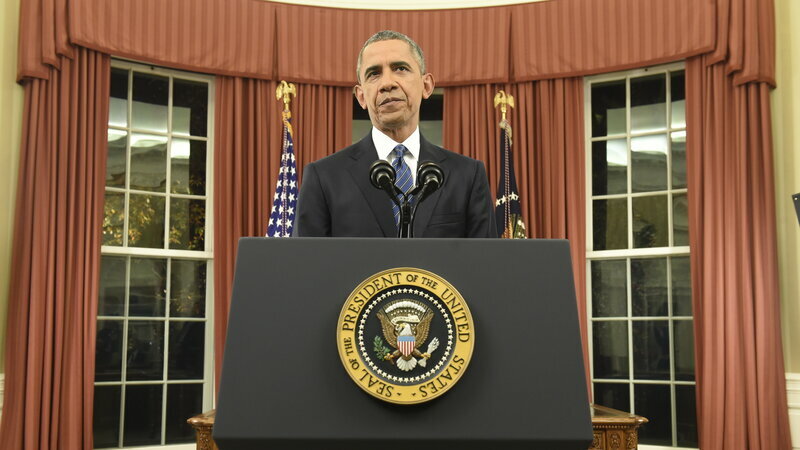 Underscoring its importance, this will be just Obama&apos;s third Oval Office address. The other two were about the Deepwater Horizon oil spill in the Gulf of Mexico and the end of combat operations in Iraq, both in 2010. Obama has addressed the nation several times since then, but has preferred other backdrops like the White House East Room where he announced the death of Osama Bin Laden in 2011. Sundays in America mean church and professional football. Obama will squeeze in his address — expected to last between just 10 and 15 minutes, according to White House staff — between games. The president&apos;s speech is scheduled to begin soon after 8 p.m. EST, which is sandwiched right between the late afternoon slate of football games, which end around 7:30 p.m. EST, and Sunday Night Football beginning at 8:30 p.m. EST between the Indianapolis Colts and Pittsburgh Steelers. In a departure from previous Oval Office speeches, Obama delivered his speech from a podium, instead of from behind his desk. He concluded his speech by reiterating that the U.S. will defeat the threat of terrorism. "We are on the right side of history," the president said. "We were founded upon a belief in human dignity: That no matter who you are, or where you come from, or what you look like or what religion you practice, you are equal in the eyes of God and equal in the eyes of the law ... So long as we stay true to that tradition, I have no doubt that America will prevail." Video of the speech is archived below, via the White House. Good evening. On Wednesday, 14 Americans were killed as they came together to celebrate the holidays. They were taken from family and friends who loved them deeply. They were white and black, Latino and Asian, immigrants, and American born, moms and dads, daughters and sons. Each of them served their fellow citizens. All of them were part of our American family. Tonight I want to talk with you about this tragedy, the broader threat of terrorism and how we can keep our country safe. The FBI is still gathering the facts about what happened in San Bernardino, but here&apos;s what we know. The victims were brutally murdered and injured by one of their co-workers and his wife. So far, we have no evidence that the killers were directed by a terrorist organization overseas or that they were part of a broader conspiracy here at home. But it is clear that the two of them had gone down the dark path of radicalization, embracing a perverted interpretation of Islam that calls for war against America and the West. They had stockpiled assault weapons, ammunition, and pipe bombs. So this was an act of terrorism designed to kill innocent people. Our nation has been at war with terrorists since Al Qaeda killed nearly 3,000 Americans on 9/11. In the process, we&apos;ve hardened our defenses, from airports, to financial centers, to other critical infrastructure. Intelligence and law enforcement agencies have disrupted countless plots here and overseas and worked around the clock to keep us safe. Our military and counterterrorism professionals have relentlessly pursued terrorist networks overseas, disrupting safe havens in several different countries, killing Osama Bin Laden, and decimating Al Qaeda&apos;s leadership. Over the last few years, however, the terrorist threat has evolved into a new phase. As we&apos;ve become better at preventing complex multifaceted attacks like 9/11, terrorists turn to less complicated acts of violence like the mass shootings that are all too common in our society. It is this type of attack that we saw at Fort Hood in 2009, in Chattanooga earlier this year, and now in San Bernardino. And as groups like ISIL grew stronger amidst the chaos of war in Iraq and then Syria, and as the Internet erases the distance between countries, we see growing efforts by terrorists to poison the minds of people like the Boston Marathon bombers and the San Bernardino killers. For seven years, I&apos;ve confronted this evolving threat each and every morning in my intelligence briefing, and since the day I took this office, I have authorized U.S. forces to take out terrorists abroad precisely because I know how real the danger is. As commander in chief, I have no greater responsibility than the security of the American people. As a father to two young daughters who are the most precious part of my life, I know that we see ourselves with friends and co-workers at a holiday party like the one in San Bernardino. I know we see our kids in the faces of the young people killed in Paris. Well, here&apos;s what I want you to know. The threat from terrorism is real, but we will overcome it. We will destroy ISIL and any other organization that tries to harm us. Our success won&apos;t depend on tough talk, or abandoning our values or giving in to fear. That&apos;s what groups like ISIL are hoping for. Instead, we will prevail by being strong and smart, resilient and relentless. And by drawing upon every aspect of American power. Here&apos;s how. First, our military will continue to hunt down terrorist plotters in any country where it is necessary. In Iraq and Syria, air strikes are taking out ISIL leaders, heavy weapons, oil tankers, infrastructure. And since attacks in Paris, our closest allies, including France, Germany, and the United Kingdom, have ramped up their contributions to our military campaign which will help us accelerate our effort to destroy ISIL. Second, we will continue to provide training and equipment to tens of thousands of Iraqi and Syrian forces fighting ISIL on the ground so that we take away their safe havens. In both countries, we&apos;re deploying special operations forces who can accelerate that offensive. We&apos;ve stepped up this effort since the attacks in Paris, and will continue to invest more in approaches that are working on the ground. Third, we&apos;re working with friends and allies to stop ISIL&apos;s operations, to disrupt plots, cut off their financing, and prevent them from recruiting more fighters. Since the attacks in Paris, we&apos;ve surged merged intelligence sharing with our European allies. We&apos;re working with Turkey to seal its border with Syria, and we are cooperating with Muslim majority countries, and with our Muslim communities here at home, to counter the vicious ideology that ISIL promotes online. Fourth, with American leadership, the international community has begun to establish a process and timeline to pursue cease-fires and a political resolution to the Syrian war. Doing so will allow the Syrian people and every country, including our allies, but also countries like Russia, to focus on the common goal of destroying ISIL, a group that threatens us all. This is our strategy to destroy ISIL. It is designed and supported by our military commanders and counterterrorism experts, together with 65 countries that have joined an American-led coalition. And we constantly examine our strategy to determine when additional steps are needed to get the job done. That&apos;s why I&apos;ve ordered the Departments of State and Homeland Security to review the visa waiver program under which the female terrorist in San Bernardino originally came to this country. And that&apos;s why I will urge high-tech and law enforcement leaders to make it harder for terrorists to use technology to escape from justice. Now, here at home, we have to work together to address the challenge. There are several steps that Congress should take right away. To begin with, Congress should act to make sure no one on a no-fly list is able to buy a gun. What could possibly be the argument for allowing a terrorist suspect to buy a semiautomatic weapon? This is a matter of national security. We also need to make it harder for people to buy powerful assault weapons, like the ones that were used in San Bernardino. I know there are some who reject any gun-safety measures, but the fact is that our intelligence and law-enforcement agencies, no matter how effective they are, cannot identify every would-be mass shooter, whether that individual was motivated by ISIL or some other hateful ideology. What we can do, and must do, is make it harder for them to kill. Next, we should put in place stronger screening for those who come to America without a visa so that we can take a hard look at whether they&apos;ve traveled to war zones. And we&apos;re working with members of both parties in Congress to do exactly that. Finally, if Congress believes, as I do, that we are at war with ISIL, it should go ahead and vote to authorize the continued use of military force against these terrorists. For over a year, I have ordered our military to take thousands of air strikes against ISIL targets. I think it&apos;s time for Congress to vote to demonstrate that the American people are united and committed to this fight. My fellow Americans, these are the steps that we can take together to defeat the terrorist threat. Let me now say a word about what we should not do. We should not be drawn once more into a long and costly ground war in Iraq or Syria. That&apos;s what groups like ISIL want. They know they can&apos;t defeat us on the battlefield. ISIL fighters were part of the insurgency that we faced in Iraq. But they also know that if we occupy foreign lands, they can maintain insurgencies for years, killing thousands of our troops and draining our resources, and using our presence to draw new recruits. The strategy that we are using now -- air strikes, special forces, and working with local forces who are fighting to regain control of their own country -- that is how we&apos;ll achieve a more sustainable victory, and it won&apos;t require us sending a new generation of Americans overseas to fight and die for another decade on foreign soil. Here&apos;s what else we cannot do. We cannot turn against one another by letting this fight be defined as a war between America and Islam. That, too, is what groups like ISIL want. ISIL does not speak for Islam. They are thugs and killers, part of a cult of death. And they account for a tiny fraction of a more than a billion Muslims around the world, including millions of patriotic Muslim-Americans who reject their hateful ideology. Moreover, the vast majority of terrorist victims around the world are Muslim. If we&apos;re to succeed in defeating terrorism, we must enlist Muslim communities as some of our strongest allies, rather than push them away through suspicion and hate. That does not mean denying the fact that an extremist ideology has spread within some Muslim communities. It&apos;s a real problem that Muslims must confront without excuse. Muslim leaders here and around the globe have to continue working with us to decisively and unequivocally reject the hateful ideology that groups like ISIL and Al Qaeda promote, to speak out against not just acts of violence, but also those interpretations of Islam that are incompatible with the values of religious tolerance, mutual respect, and human dignity. But just as it is the responsibility of Muslims around the world to root out misguided ideas that lead to radicalization, it is the responsibility of all Americans, of every faith, to reject discrimination. It is our responsibility to reject religious tests on who we admit into this country. It&apos;s our responsibility to reject proposals that Muslim-Americans should somehow be treated differently. Because when we travel down that road, we lose. That kind of divisiveness, that betrayal of our values plays into the hands of groups like ISIL. Muslim-Americans are our friends and our neighbors, our co- workers, our sports heroes. And, yes, they are our men and women in uniform who are willing to die in defense of our country. We have to remember that. My fellow Americans, I am confident we will succeed in this mission because we are on the right side of history. We were founded upon a belief in human dignity that no matter who you are, or where you come from, or what you look like or what religion you practice, you are equal in the eyes of God and equal in the eyes of the law. Even in this political season, even as we properly debate what steps I and future presidents must take to keep our country safe. Let&apos;s make sure we never forget what makes us exceptional. Let&apos;s not forget that freedom is more powerful than fear. That we have always met challenges, whether war or depression, natural disasters or terrorist attacks, by coming together around our common ideals as one nation and one people. So long as we stay true to that tradition, I have no doubt that America will prevail.